Pocket sized pack of 12 paper toilet seat covers. 4 packs, total of 48 pcs. Packed in resealable plastic bags. Fit in your handbag or pocket with ease when you travel. MaxCare understands that people around the world worry about the lack of hygiene in public toilets. This is one of the reasons why we provide disposable toilet seat covers designed to help you stay away from germs. Regardless of how hard you try to keep your restroom clean, it is not possible to always keep the germs and bacteria away that hide on your toilet seats and in the corners of your bathroom. How to Keep Germs Away? In order to keep bacteria and germs away, the most important thing you will need to do is to clean your bathroom thoroughly on a regular basis. However, bacteria can build up again quite quickly even if you scrub daily or bleach it. The rate at which they reproduce is quite phenomenal so it can be quite difficult to always keep your toilet sanitized, regardless of how hard you try. How Effective are Toilet Seat Covers? Toilet seat covers are regarded today as the best possible solution for all problems such as infections and diseases resulting from the use of public toilets. Toilet seat covers create a barrier between you and the seats in the bathroom to maintain hygiene effectively. Since they are biodegradable, they dissolve very quickly once you flush them. Their effectiveness is not something that is to be doubted because they do help protect you from direct contact with dirty, bacteria infested seats and can be very helpful, especially if you have a weaker immune system. 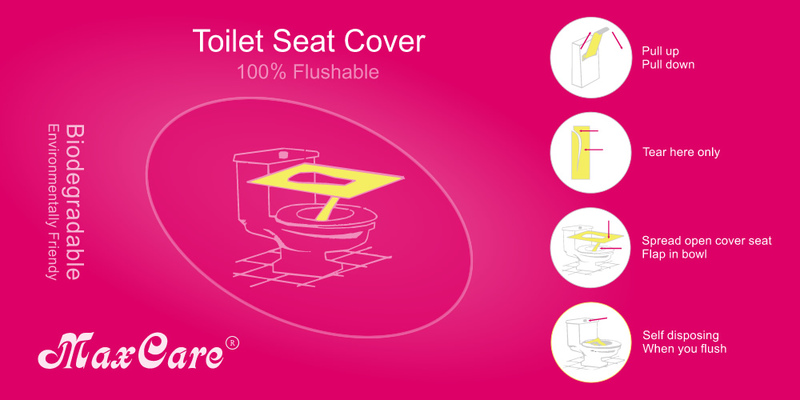 Toilet seat covers can be used at home or in public restrooms when you travel anywhere. Because they are available in handy packs, they are easy to carry in your purse or in your bag. Place your order securely online now or contact us on 02 9585 0658 for bulk order discounts. Please contact us for wholesale or bulk order discounts! © 2019, Asian Sources Pty. Ltd.